Starter Package: Breaking Free from a World of Worry - How to Let Go and Find Peace in the Face of Life's Uncertainties from Ready2Go Marketing Solutions, Inc. Excessive worrying is one of the most crippling things that humans do on a daily basis. Sure, it’s natural to be concerned about things going wrong from time to time. The trouble comes in when you let your worry consume you. Whether you’re worried about money, housing, relationships, or something else entirely, it’s important to know that your worrying may be the very thing standing in the way of you actually finding a solution to your problems. Therefore it is more important than every to identify and stop your worrying habits before they steal your joy, your relationships, your livelihood, and even your health. 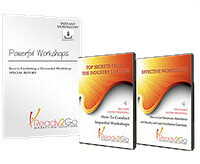 This Starter Pack on Breaking Free from Worry will give you the ability to provide great value to your current and potential clients about a VERY RELEVANT topic that plaques millions, and most certainly them or someone they know and love. And the special report, articles, success tips and tweets in this Starter Pack give your clients a tremendous amount of tools and strategies for identifying and eliminating the destructive habit of worrying so they can get back to creating and living the life they love!